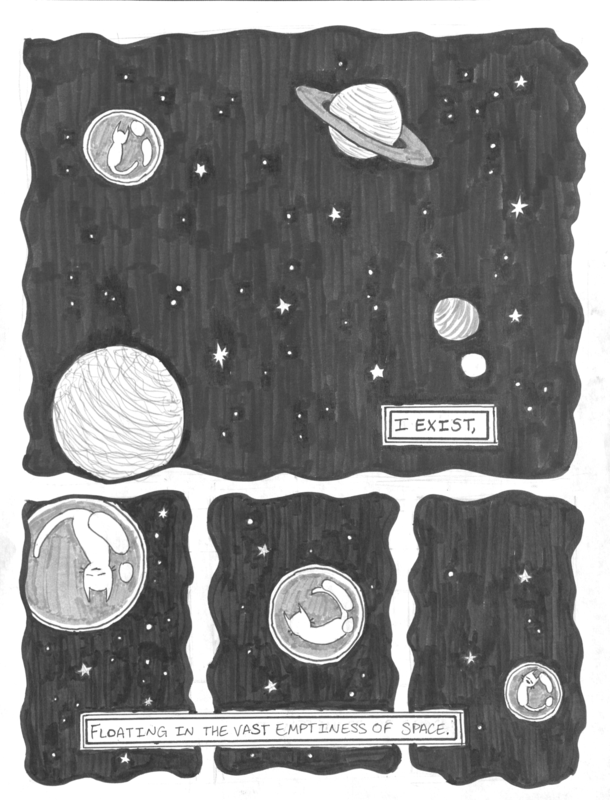 Back in 2015, I took a course on graphic novel design, and the final project was to write & plan out your own graphic novel. 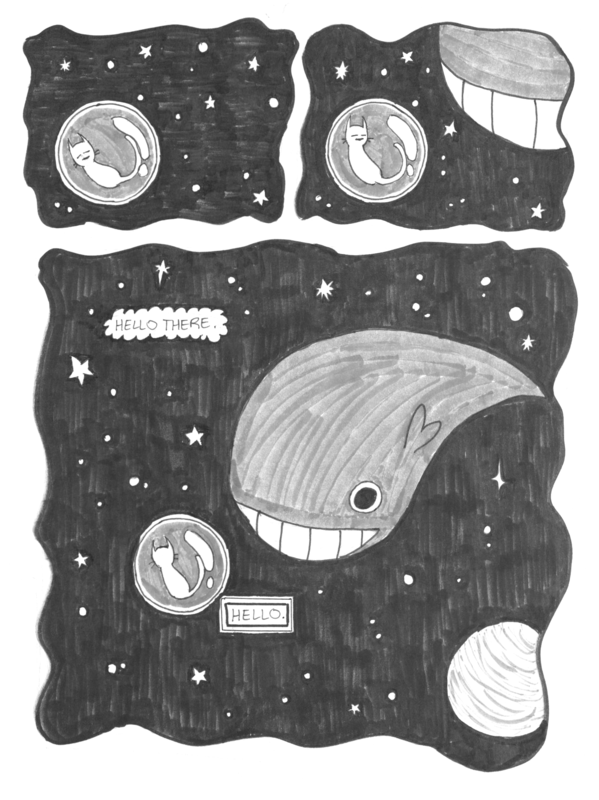 My project was called Space Bubble Cat, a very personal piece about a lonely cat who floats through space. This was intended to be a submission for the June 2018 Bitsy Jam (theme: Space Whales), where I was inspired to revisit this project, update and finish it from its original version into an interactive Bitsy comic. However, I was not able to finish by the deadline of the jam. How to Read: Move to the bottom-right corner to turn the page. Read all speech bubbles in a panel before moving onto the next. As a general rule, speech bubbles are read from top to bottom. Music: "daydream" and "apprehension", from the album Think by motherbear (the album has since been taken offline, but I encourage you to please check out her other stuff as well). Thanks to Ayo for Borsky, Sean & Ducky for hacks, Em for playtesting, and Adam for making Bitsy. 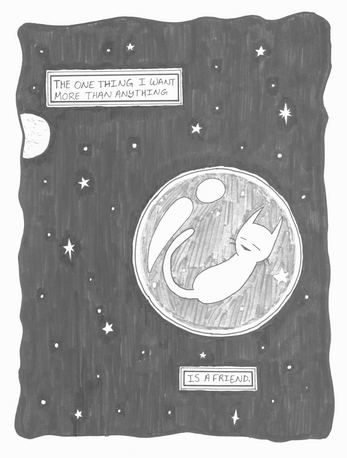 Space Bubble Cat also has a twitter and an instagram, which are rather inactive right now, but I would love to start them up again sometime soon. I love this so much! It's such a great use of bitsy, the music is perfect for the atmosphere, and the writing was very heartfelt and well done! The art is so cute and the story is so touching <3 i really appreciate this, i hope you keep doing amazing stuff or just doing the things that makes you happy! This is powerful. Masterly illustrated, written & paced. CW "sad" is accurate! Thank you for "owning friend". What a creative use of bitsy and storytelling! After awhile of trying to get out of each panel, I began to feel trapped like the cat - which made the story even richer and more personal. I also loved your character designs! I am so full of feeeeeelings! It is so cute, and so sad, and that nightmare sequence was terrifying, and the space bubble feels like such a good image to express how I feel sometimes. I do not cease to wonder what can be done on the bitsy. Your game and how made this comics is awesome! I hope there's a sequel. I need more Bubble Cat. you're just trying to make me cry arent you!!!!!! heck this is so good!!! im so emo tho rip ITS SO BEAUTIFUL AAAAAAAAAAAAAAAAAAAAAAAAAAAAAAAAAAAAAAAAAAAAAAAAAAAAAAAAAAAAAAAAAAAAAAAAAAAAAAAAAAAHHHHHHHHHHHHH!!!!!! Wow! That was an impressive and such a creative/original use of Bitsy. i really like this! the comic panel structure is so cool and like it builds this really strong mood and idk it's just a good good game! !